If a reader likes a romance story where the female lead is the stronger character, then Take Me Now>/i> is the book to explore. Aela, the heroine, is funny, sunny and accomplished. Her bubbly personality is introduced early on and she endears herself to other secondary characters in the novella as well as the reader. Nairn is the injured hero with a type A++ personality that is so driven, his first impression is kind of loopy and goofy because he checked himself out of the hospital before he should have and was still ‘out of it’. His candid ramblings, though brief, give a clear insight into what his brain, unfettered by logic, societal expectations and proper behavior, already knows – Nairn’s inner lover is already smitten. It takes a while for the rest of him to catch up. The mystery that stirs the plot is basic corporate sabotage. Who could it be, what is the motive, and who will have the next casualty, are some of the questions that must be answered before the ultimate deal can be wrapped up and the end of their working relationship comes to pass. The author did a good job of keeping the villain under wraps until the big reveal. In this novella, the personal conflict is based upon assumptions. Like I said earlier, Nairn is smitten but he’s really slow on the uptake. What he’s quick to do is tumble into sulky, grim episodes of jealously every time Aela talks about the mysterious Jed, goes out on the town by herself or smiles and seems to have a special relationship with his father. The poor hero just can’t come out and ask for explanations; no he gets all grumpy and becomes an AA+ workaholic, until he thaws, until he gets uptight, until he thaws. Yeah, for such a rich business genius, the hero just can’t seem to strategize a relationship as well as he does a business deal so he’s an emotional yo-yo. You can imagine how that affects Aela. And that is where the heroine’s strength comes in. She does not need Nairn, or any man, to take care of her. She’s confident in who she is, so sure, his hot and cold routine annoys and ticks her off but she does what she wants, and usually, somehow, she does it with a cheeky grin. Which makes the hero even growlier and that makes me laugh even more. He’s not used to a woman who acts like she does, and that’s why I liked their dynamic. She’s the perfect woman for him because she stands up to him. The book’s pace does plod because of all the travel details. Many readers might find all the descriptions, locations and step by step process of their working relationship fascinating because it does provide a level of authenticity to the telling. I just found it bogged down my reading speed. It proves to me that the heroine knows her stuff, especially flying, and the hero gives her plenty of opportunities to show it, but I didn’t find it helped the romance grow much. I’m not a fan of quite that much minutia. The solving of the mystery is mild. The ultimate revelation of their love for each other is mild. The tone of the novel is sweet and busy. I liked the dialogue between both Nairn and Aela and I enjoyed the small touches the author had Aela giving Nairn when he was at his most stressed. Those were loving touches that soothed and showed her level of caring for the hero. It’s those sweet, tender moments that made this such a nice story to read. 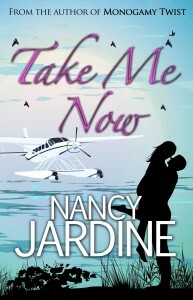 Take Me Now>/i> has a light plot with a pleasant and enjoyable romance. It’s a good book.